Early state governments during this period had evolved. The first governors after the Declaration of Independence were little more than figureheads who depended on legislatures for their existence. By the mid-1780s, most governors were functioning chief executives with veto power over legislative bills. Two states, Pennsylvania and Georgia, began with unicameral legislatures. They soon recognized the error and established bicameral law-making bodies. It was time for the national authority to evolve as well. The AC was a noble first effort, and the acquired wisdom from its mistakes is plain to see in the 1787 Constitution. The powers necessary to any umbrella government include those over commerce and taxation. To properly exercise them, all governments naturally have legislative, executive, and judicial institutions. As opposed to despotic regimes in which these functions are in the hands of one man, in republics these institutions are kept distinct. A grant of legislative, executive, and judicial authority to the AC congress would have established a tyranny! Rather than go on with a failed system and hope for the best, the Framing generation identified and corrected the shortcomings of the AC. 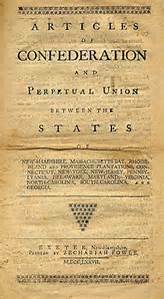 The 1787 federal convention didn’t arise ex nihilo, out of nothing. After several years of confederation in war and peace, the inadequacies of the AC were corrected in a formal Constitution of government. Our challenge today is much easier because we see the corruption of the Framers’ system all around us AND we know what worked in the past to keep free government. Whereas in 1787, the Framers dealt with a nearly blank slate, we do not. We know what is necessary to restore free government. Let’s do it. Burnett, E. C. (1941). The Continental Congress: A Definitive History of the Continental Congress from its Inception in 1774 to March, 1789. New York: W.W. Norton Company. p. 277. Fowler, W. M. (2011). American Crisis – George Washington and the Dangerous Two Years After Yorktown, 1781-1783. New York: Walker Publishing Company. pgs. 1-2. McLaughlin, A. C. (1905). The Confederation and the Constitution. New York: Harper and Brothers Publishers. p. 171.